Gor Mahia are keen to give top striker Paul Kiongera a long term contract at the club when his one year loan deal expires at the end of the year. In this regard, the 2013 Kenya Premier League champions have started talks with KCB inorder to keep the striker though nothing has been agreed on so far. Kiongera was loaned to Gor Mahia at the beginning of this season on an initial one year contract. He has so far scored four goals for Gor Mahia and is one of the key players, who have helped the club to win the title. 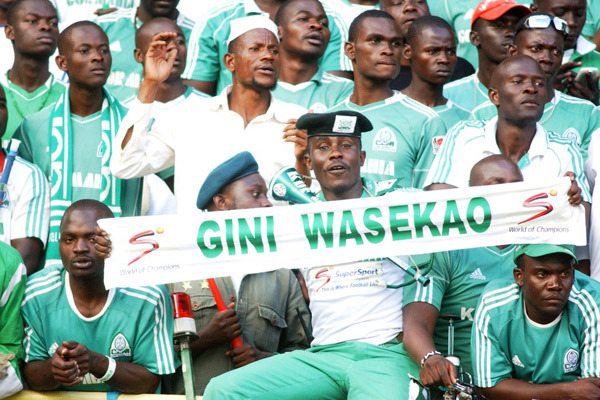 Gor Mahia Secretary General George Bwana has told Goal that they are doing everything possible to keep the striker. This story about Peter Dawo also has a very brief video showing the goal scored by Abbas Khamis Magongo during the 1987 Africa cup winners cup final, first leg match played in Tunis. 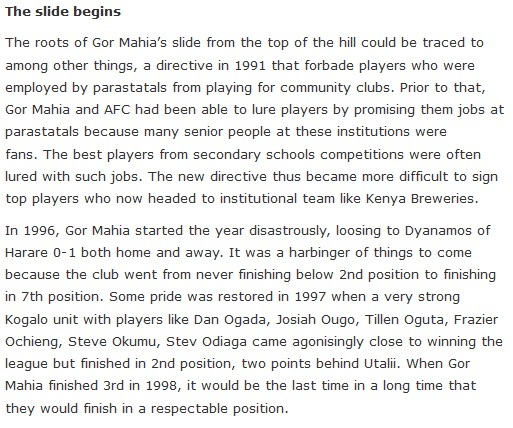 This appears to be the only footage of Gor Mahia in the 1980s that is publicly available. It appears that Kenyan television stations have these videos available but for some strange reason, they are just sitting on them. Also unfortunately, the footage only shows about 15 seconds of action. It did not even show the goal second goal that was scored by Peter Dawo. Most fans especially fans of that era would give anything to see more camera footage from that glorious era. To relive those glorious days and show people how good some of these players are. The TV stations that have this footage are sitting just on a goldmine. Kenyan Premier League (KPL) champions Gor Mahia will be awarded the winning trophy on Sunday at the Moi International Sports Centre, Kasarani. The team will be feted during their match against KCB after KPL changed the date from end of season to this weekend. KPL Chief Executive Jack Oguda had initially indicated that they want to present the trophy on the last day of the season when Gor Mahia plays Ulinzi at Afraha Stadium in Nakuru but this was changed at the request of the winners. Gor Mahia Secretary General George Bwana says while they are happy with the new development they would have preferred to get the trophy on Saturday so as to give as many of their fans as possible an opportunity to be part of the ceremony. “We are talking to KPL to see if they can change the date. Our fans will be travelling from all over and so Saturday is a good day to enable them travel back to their destinations,” Bwana told Goal. Meanwhile, Gor Mahia goalie Jerim Onyango is looking forward to lifting the title after 18 years of waiting. Last year, Onyango had a chance to lift the title, but his first half howler gifted Thika United a goal that would prove vital in stopping Gor Mahia’s ambition. However, this year, K’Ogalo has won it tidy and early and the man, who shed tears at City Stadium, last year, will cry no more. “I feel very excited to be among the history makers for Gor Mahia. I will be the first captain in 18 years to lift the league title for Gor Mahia. It is more than a privilledge for me. “We have been the most consistent team this season and I believe we deserve the title. The players have worked very hard in every single game even when we are seemingly losing gas. The management has taken care of us well and the fans have been with us from the start to finish. What makes a club legend ? In the case of Gor Mahia it is usually a person who played a pivotal role in winning several important trophies and played for the club for a reasonable period and maintained stellar performances over that period. 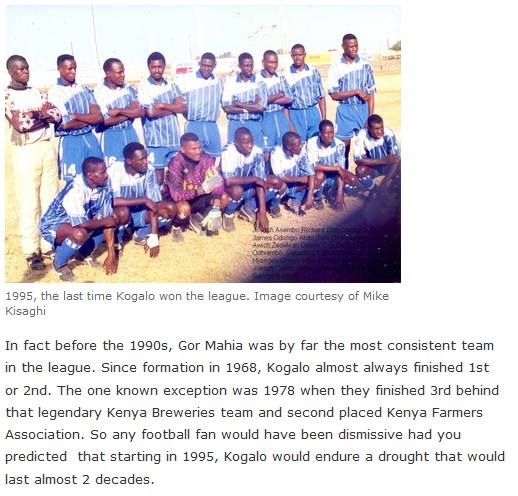 When speaking of Kogalo legends, one of the first names that comes to mind is current assistant coach John Bobby Ogolla. This man is arguably the best central defender Kenya has ever seen. In his prime he was quite simply a boulder, a tower of strength. Back when the CECAFA cup captured the imagination of people all over East and Central Africa, Bobby was well known all over this region. 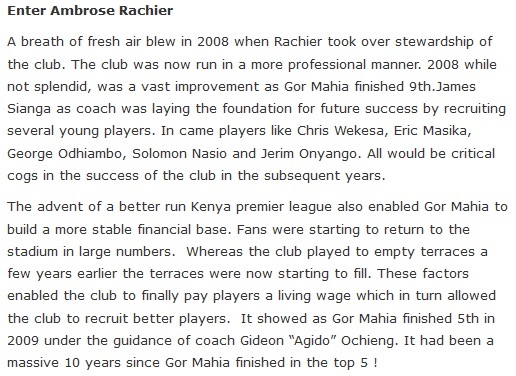 And he was an important pillar when Kogalo won 3 CECAFA cups and several league titles. He was also key to helping Harambee stars win 3 succesive CECAFA senior challenge cup titles. Other club legends include Nahashon Oluoch “Lule” arguably the best player when Kogalo reached the Africa cup final in 1987. That year Lule was voted one of the 10 best players in Africa. He played alogside another legend in Allan Thigo who was player coach when Gor Mahia won the league unbeaten in 1976 and reached the Africa cup winners cup final in 1979. 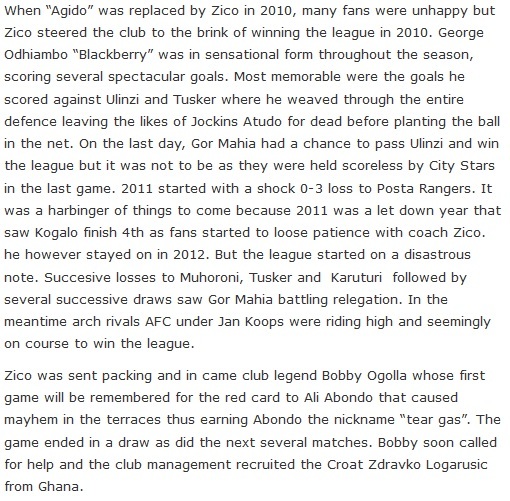 Thigo simply overwhelmed the opposing teams and commanded the entire field thus earning the nickname “Ogango Wuon Pap”. Speaking of commanding the field, Abbas Khamis Magongo comes to mind. His command of the midfield helped steer Gor Mahia to winning the 1987 Africa cup winners cup. However that cup would never have happened without the scoring ability of Peter Dawo who scored 10 goals in that campaign. No matter how talented a team is, and that 1987 team was very talented, it cannot win without a dependable scorer. A role Dawo fulfilled so well that it propelled him to legendary status and resulted in him being voted one of the 10 best players in Africa alongside compatriot Ambrose Ayoyi. The latter formed a formidable partnership with Sammy Onyango “Jogoo” a man who almost always scored against arch rivals AFC Leopards , thus giving Kogalo several important wins over their rivals. He is the one person AFC defenders of that generation have admitted they feared. Which brings us to Dan Sserunkuma, a man who has also scored against AFC Leopards almost every-time he played them. 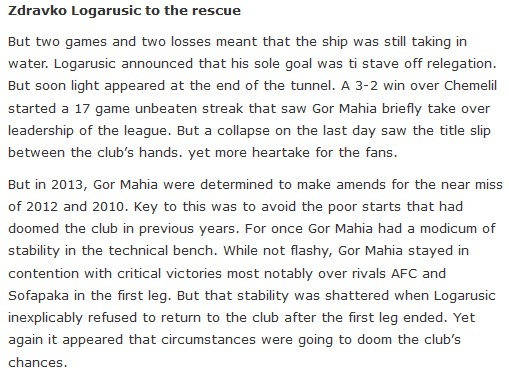 Just this year, upon returning from Armenia, it looked like AFC was going to bury Gor Mahia when after 50 minutes they were up 2-0. But Sserunkuma put Gor Mahia on the recovery path by scoring the first goal before David Owino grabbed the equalizer. One can make that argument that the come from behind performance against AFC was one of the most pivotal moments of the season. From that point on, Sserunkuma went on a tear, scoring crucial goals in almost every game in including GoTV cup matches. To underline his class, his own team-mates carried him shoulder high when he scored that stunning winner against Sofapaka that virtually clinched the league. Its worth noting that Sserunkuma was also the club’s leading scorer during the 2012 season when Kogalo almost won the league. This is the kid of performance that makes legends. His goals come in every manner from rebounds, one-twos, long range bombs, volleys you name it. His performance has left coach Bobby Williamson impressed. “The boy (Sserunkuma) is amazing, scoring important goals for us. Letting him go will be a big mistake.” Williamson told michezoafrika. Next year as Kogalo pursue glory in the Africa champions league and the CECAFA cup, they will the proven scoring skills of Sserunkuma. He could cement his place as a club legend by helping the club become the first Kenyan team to reach the champions league group stage. “As coach I will do my best to ensure he stays at the club. To be the best you need such aggressive players in your team.”Added Williamson. In this writes views, Sserunkuma could play the role Dawo played during those glory years. Indeed this year has seen heroic performances from a number of players. Notably the defence and goalkeeper Jerim Onyango which carried the team during the first leg of the season when goals were hard to come by. There is an opportunity for some of the players to stamp put their name permanently in the pantheon of club legends and some are already on their way there. Kakamega Homeboyzs’ chances of surviving in Kenyan Premier League were dealt a major blow after going down 1-0 to champions Gor Mahia at Kasarani on Sunday. The men from Kakamega needed a win badly to drag themselves off the drop zone, but the loss at the hands of the just crowned champions complicates their chances of avoiding the chop. They threw everything at Gor Mahia and were only denied by inexperienced finishing, a stable Ivo Mapunda and at times, the cross bar. 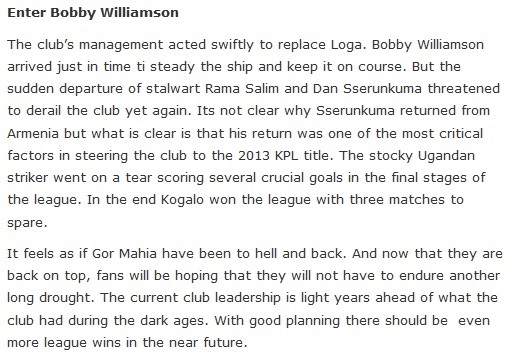 Gor knowing that the title was well secured in their cabinet played with a lot of comfort and Coach Bobby Williamson had the prestige of playing around with his starting line up. Jerry Onyango, Israel Emuge, Kevin Omondi and Dan Sserunkuma were among the stars, who were rested for the tie as the likes of Ivan Anguyo, Solomon Nasio and Paul Odhiambo got a starting berth. The latter was tasked with proving his worth in attack, but he never succeeded as he failed to score in more than one occasion. Edwin Lavatsa had a chance for the hosts in 18th minute but his effort from Moses Odhiambo’s pass was saved by Homeboyz goalie Collins Otieno, who had a superb game. On the opposite end, Homeboyz had a chance to break the deadlock but Keiphas Baraza struck over from Moses Mudavadi’s cross. Lavatsa finally broke the deadlock in 37th minute with a well taken shot after beating the offside trap from Anthony Akumu’s pass. Three minutes later, roles changed with Lavatsa turning provider, but Odhiambo struck his shot straight to keeper Otieno. Homeboyz were better in the second half as they increased the tempo on their attack. Moses Mudavadi had a decent chance for the visitors almst at restart but Ivo Mapunda saved with his feet after Mudavadi was flicked on by Andrew Kulecho. Keiphas Baraza was denied by the bar in 55th minute after he tapped in a cross from skipper Titus Wamalwa. On the opposite end, Gor also tried to increase their lead with Paul Odhiambo tapping wide from Lavatsa’s cross and substitute Mungai Kiongera having a rasping left foot shot hit the bar. Gor Mahia have now amassed 59 points with two matches to go while Homeboyz still languish at position 15 with 26 points, one off the safe zone. Gor Mahia has been awarded the three points of their abandoned match against SoNy Sugar that was abandoned on Sunday 1 September at the Awendo Stadium. The match was abandoned after SoNy players protested Gor’s equalizer that was scored by David Owino. -The match reports indicate that Sony Sugar technical bench led by their coach and captain confronted the 1st Assistant referee to protest the goal awarded and that the conduct of the coach and his captain provoked Gor Mahia fans who pulled down the perimeter fence. -It is our finding that from the moment the Sony Technical Bench and Captain rushed to the 1st Assistant to protest the goal, the game never resumed and could not have resumed even if both teams wanted to play. -What happened thereafter was a consequence of the initial action and whoever initiated it caused the abandonment hence, SoNy should be held liable and forfeit the same. With the three points, Gor are now thirteen points clear at the summit of the KPL with four matches to go and it’s correct to say that they are the Kenya Premier League 2013 Champions elect. And cometh the hour, cometh the man as they say. Leading scorer, Ugandan Dan Sserunkuma, etched his name in the hallowed roll of Gor Mahia legends by sinking an 89th minute winner to snuff out the challenge of closest rivals Sofapaka 1-0 on Wednesday at the Moi International Sports Centre, Kasarani. The agonising 18-year wait is still a point to being of being officially confirmed but no one is in doubt- K’Ogalo are the 2013 Kenyan Premier League (KPL) champions! The champagne can now be uncorked! “It’s not good for my heart!” Bobby Williamson, the Scotsman who led Gor past the finish line in a tense encounter gasped after the final whistle, with his players and the Green Army involved in a rancorous lap of honour. “You can see what it means to them, they have waited for it for a very long time. We never played as well as we can do but their determination did it in the end,” he added, admitting that it was not pretty to the eye but nonetheless, the job was done as the doctor ordered. On Sserunkuma, the talisman who angled for a move away from the club two months ago, Williamson, the former Uganda Cranes coach who did not give the diminutive player a look in for the national side had only one clear answer. 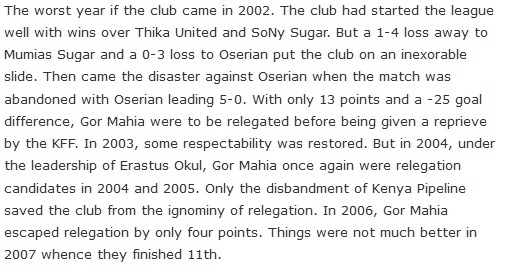 For Sofapaka, the latter day titans who picked up the crown in 2009, it was a bitter end to their spirited fight to deny Gor the inevitable after a match they shaded possession and chances. “We did well, we possessed the ball in the first half and the only thing we lacked was a goal and that was our undoing. Today was not our day,” midfielder Bernard Mangoli, who was declared the man of the match told. His Ugandan coach, Sam Timbe, who would have enjoyed a fairytale introduction to the KPL had he succeeded in supplanting Williamson whom he moved here from across the border well into the second leg, was crestfallen. “We lost chances and we were punished and at the end of the day, they are where they are. “That is football and we will build on our key areas for next season,” he offered as he ensured he would melt away from the scene at the first opportunity. In a cagey first half, Gor’s latest sensation, Tim Wanyonyi, blew over the first clear cut opportunity to score when Sserunkuma cut the ball back from the by line, with the youngster somehow putting the ball past Duncan Ochieng in the Sofapaka goal just after the half hour. The 2009 champions came so close to scoring twice in as many minutes after the break, with Mustapha Kasolo and veteran John Baraza, their top marksman heading wide and being thwarted by Gor custodian, Jerim Onyango in that order. Williamson brought on former Stars international, Patrick Oboya, Paul Kiongera and Moses Odhiambo to wrest back control of the midfield in the dying minutes. Oboya’s pace and trickery made the difference, first releasing Wanyonyi on goal with a tearing pass on the 78th, only for the youngster to pass up the chance for glory by once again finding the wrong side of the post. Minutes later, his attempted header across goal to set up Sserunkuma in the box fell to Ochieng’s grateful hands after being miscued but his next telling contribution made all the difference. Oboya back heeled flick saw Sserunkuma tear past two defenders and lob Ochieng for the winner besides cuing the bedlam among the Green Army who at long last, could start the mother of all parties like it was in 1995. League leaders Gor Mahia will take on second placed Sofapaka in a pivotal KPL match at Kasarani on Wednesday. A win for Kogalo will see put daylight between them and Sofapaka and put them on the brink of winning the title. It will mean the most number of points Sofapaka can gain is 52 points, thus throwing them out of contention. A win for Sofapaka add yet more tension to the league as Sofapaka will now be only 4 points adrift. Should AFC also beat Karuturi, they will still be in contention however if Gor Mahia beat Sofapaka, they would then need just one point from their remaining matches to gain an unassailable lead over AFC. To achieve a win over Sofapaka , Gor Mahia will be counting on stocky Ugandan attacker Dan Sserunkuma who has been in sensational form of late. He sat out of the match against SoNy Sugar on Saturday. A good move by coach Williamson. Fans will also hope that Joseph Wanyonyi, Kevin Omondi and Eric Ochieng who have been in form lately maintain their form. The defence has been solid all year round and will be counted on to hold off Bob Mugalia and the rest of the Sofapaka strikers. 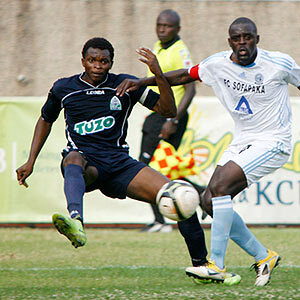 Sofapaka have vowed to fight to the bitter end. “They have all the reasons to be confident of winning the title; they have a healthy lead, but anything can happen. They may end up collecting just a single point in their remaining games,” said Sam Timbe their Ugandan coach to the Daily Nation. 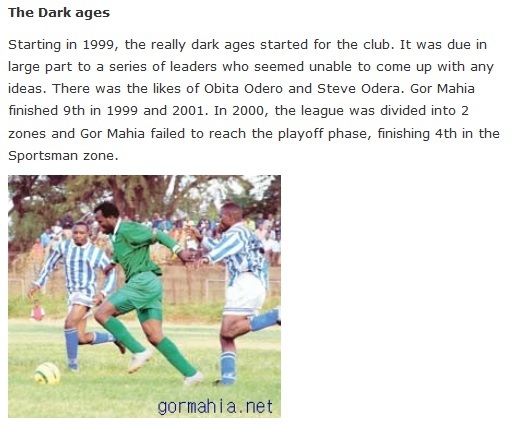 When these two teams last met in the KPL, Gor Mahia won 1-0 thanks to a Kiongera goal off a cross from Edwin Lavatsa. May the 12th man show up in large numbers at Kasarani to carry the team. Also fans should behave themselves and accept the results regardless of outcome. Kickoff time is 17:00 at Kasarani.